Sometimes I get a hankerin' for a certain type of cuisine, but I just don't have the ingredients in my pantry that are intrinsic to that particular style of cooking. This happened to me not too long ago when I really got a craving for something in the Cajun/Creole department. 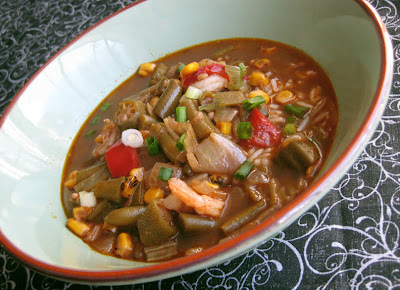 I knew I had frozen okra, and we always have flour and butter on hand for a roux, so gumbo was a possibility. However, it was such a cold day, I decided a gumbo soup might be more comforting. Then I looked in the fridge and realized that I didn't have the ingredients necessary for the trinity: onion, bell pepper, and celery. I had an onion, but no celery whatsoever and the only bell pepper I had was a jar of pickled sweet red peppers. This, however, would not deter me. After some thought, I decided to use the pickled red peppers and add some ground celery seed to impart the celery flavor. Then I added chicken stock and seasoned the mixture with spices I felt would create that familiar Cajun flavor. It was still missing something, though. It had spicy heat, but a certain depth and sweetness was needed. I remembered how people added chocolate to chili, so I grabbed a jar of Nutella and dropped a blob of the chocolate and hazelnut spread into the soup. The added nuttiness and rich, chocolate sweetness balanced the spicy flavor nicely. The rest was just a matter of adding some frozen vegetables and protein. The result was a satisfying soup that closely imitates the flavor elements of gumbo while having its own unique qualities. For example, the pickled sweet red peppers add a certain brightness and acidity. The Minx even said it tasted better than most gumbos she's eaten. Give it a try! Start a roux by adding the flour and cold butter into a dutch oven over high heat. As the butter melts, the flour will begin to toast. Stir the melting butter into the flour so that, by the time the butter is thoroughly melted, the mixture should take on a caramel color. Continue stirring until the roux turns a milk chocolate color. Turn the heat down a bit to medium-high and add the onion, red bell pepper, and celery seed to the roux and stir together. Sprinkle some salt in at this point to sweat the onions. Once the onions are softened, put in the garlic, chicken stock, and water. Mix to combine and bring the liquid to a boil. Add the okra, corn, and string beans along with the cayenne pepper, paprika, thyme, and Nutella spread. Stir everything together and bring it to a boil. Then turn the flame to low and let the soup simmer, covered, for about 1 ½ hours. After the soup has simmered for 1 ½ hours, taste and adjust the seasoning as necessary. At this stage, if you want to give the soup a restaurant look, you can puree everything together with a stick blender. Otherwise, you can leave it chunky and rustic as shown in the picture. Add your raw shrimp and leave to cook for a few more minutes (until the shrimp turn pink). If you don't have shrimp, you can substitute almost any precooked protein like leftover chicken or pork. Serve with hot steamed rice. Makes 4 entree servings or 6-8 appetizer servings. theminx's thoughts: I was pretty amazed when Mr Minx told me he used Nutella in the soup. I couldn't taste it at all, and thought that he had to be kidding. But no, he was serious, and I have to give him credit for being daring. It worked. And the celery seed and pickled pepper combo was a dead ringer for fresh celery and bell pepper. Whoda thunk it?